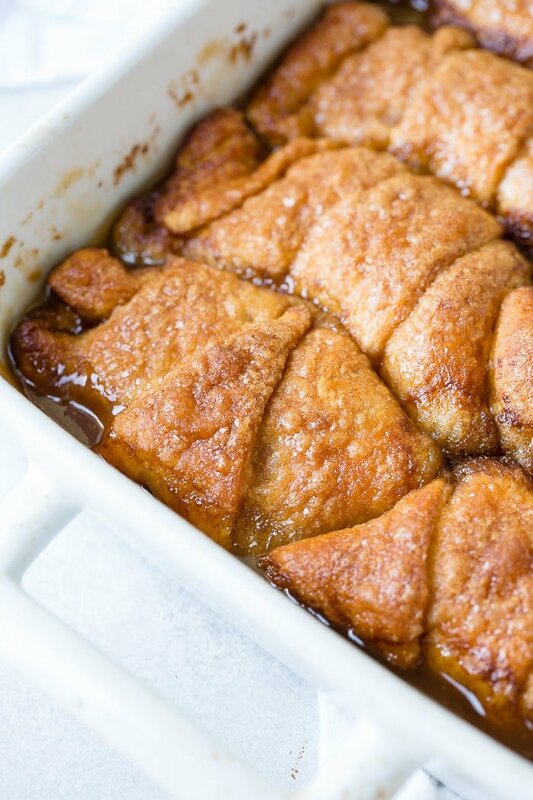 ‘Who knew that crescent rolls, cinnamon sugar apples, brown sugar, butter and sprite could make the best easy apple dumplings with sprite ever! 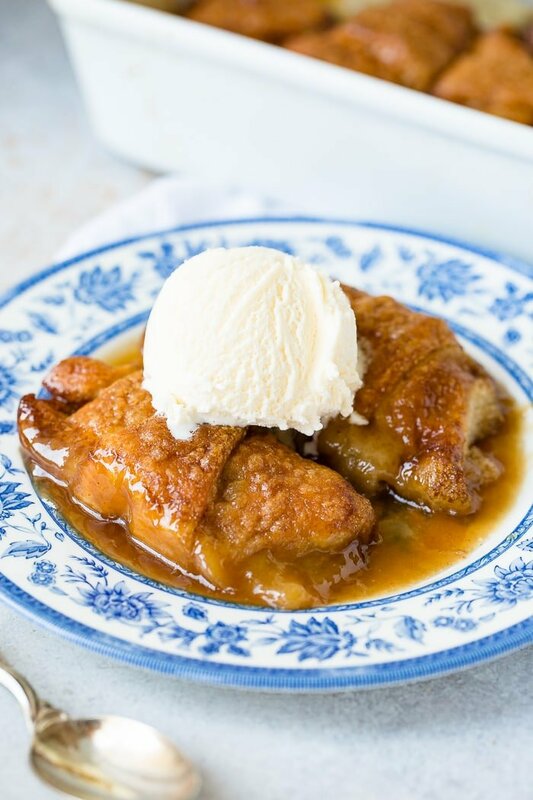 Ditch your old Apple Dumplings Recipe. Do it. Ditch it. 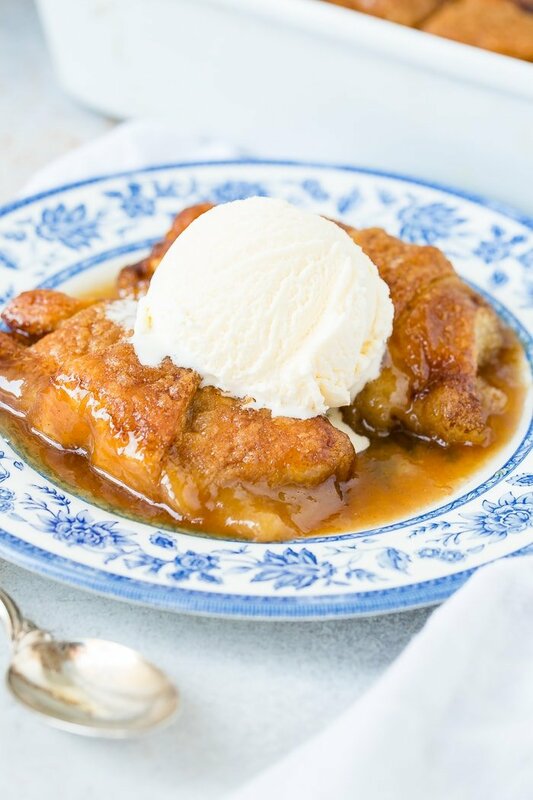 This Easy Apple Dumplings with Sprite recipe has a couple of very minor changes that make a HUGE difference and I’m totally not kidding. I’ll never make another apple dumplings recipe again. 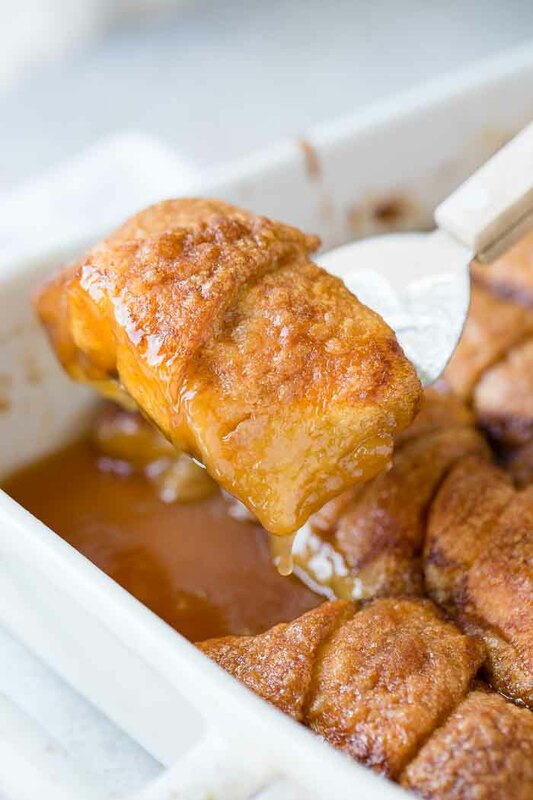 This recipe reminds me so much of my grandma’s apple rolls recipe just because that sugar liquid is so deceiving. You pour it all around the rolls and it almost puts you into a panic attack seeing all of that liquid around dough, like is this really going to work?! Are they going to be a soggy mess?! And then those golden, crisp, pillows of dough come out and you’re a real life hero to the whole family. This is seriously the craziest apple dessert recipe. Most apple desserts seem to pull from apple pie a bit. Think about it, apple crisp, similar to apple pie or dutch apple pie, or apple pull apart bread, still those yummy apple pie apples! Or one of my all time faves, Brown Butter Apple Pie Scones! This recipe is similar but as I’ve been making recipes from others over the years I felt like there was always something missing. Sure, it is a good recipe and one that your guests will love you for, but couldn’t it be taken up a notch without changing the whole recipe? We started experimenting, a lot. 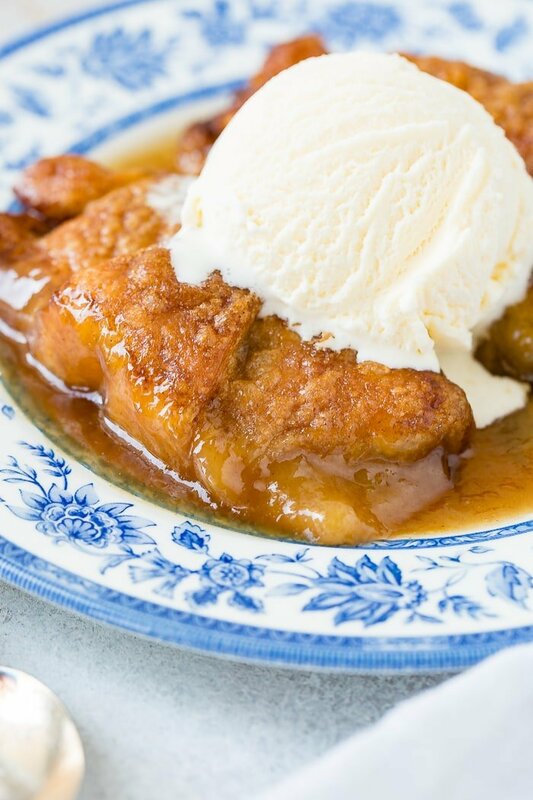 I could hardly stand to look at another apple dumpling recipe, let alone the apple dumpling itself. And then it hit me, when you’re trying to do something awesome and it’s not coming together, go back to the original recipe. So I did. And do you know what I discovered? The apples were not like an apple pie, they were completely plain. No, no, no! Apples need a little cinnamon sugar action to really drive home that fall smell and flavor! Well don’t stop there, I thought. We need a little cinnamon action in the butter mixture as well. Too many recipes called for just butter and brown sugar. We added vanilla and cinnamon. Let’s get this party started! Yes, you read right, we want to use a lemon lime soda around the dumplings, but never over the dumplings. If you pour the lemon lime soda over the dumplings the brown sugar butter sauce won’t have a chance to crisp up the topping and we aren’t looking for soggy dumplings. But then I changed that too. Everyone said to use 1 1/2 cups of sprite with the apple dumplings, but I just found that to be too much. We lowered it to 1 cup so the sprite for sure wouldn’t go over the top but you’d still end up with a caramel sauce underneath. You can make homemade crescent rolls, but then this goes from easy recipe, to crazy long recipe. So, to make apple dumplings with crescent rolls, just buy a package of original, not butterflake or fat free crescent rolls from your local store. 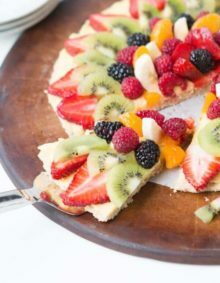 Keep the dough in the fridge until you’re ready to use it and then carefully separate each triangle on a Silpat or parchment paper to keep it from sticking. The apples need to be peeled, chopped and rolled in cinnamon sugar before being rolled up in the crescent roll dough, and then it’s a matter of pouring things over the top! Like I said, making crescent rolls from scratch is a bit of a process compared to just buying them, but you also know that we ADORE homemade bread so if you’d like to make them use this recipe for Homemade Crescent Rolls by Brown Eyed Baker. Can you Use 7 UP Instead of Sprite? Everyone always asks about the pop or soda for apple dumplings. You can actually use three different kinds of pop. What Temp to Bake Apple Dumplings? Apple Dumplings should be baked in a hot oven. 350 degrees puts just the right crispness in the top of the apple dumplings. How Long Are Apple Dumplings Good For? Apple Dumplings can be kept for up to two days at room temperature. Cover lightly and refrigerate for up to an additional 2-3 days. 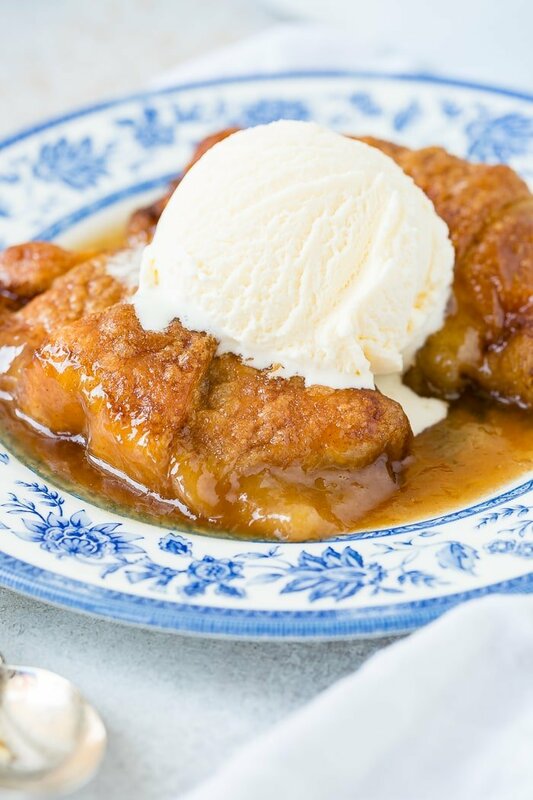 Can You Make Apple Dumplings Ahead of Time? 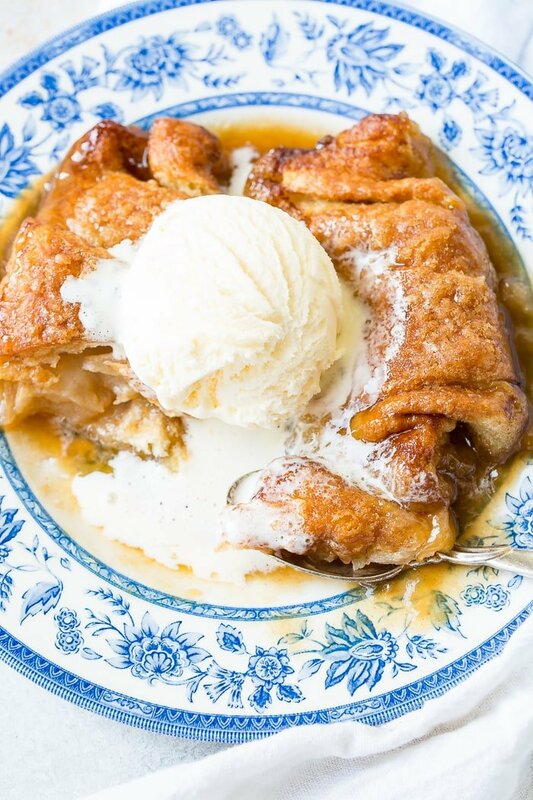 You can make apple dumplings a day ahead of time. 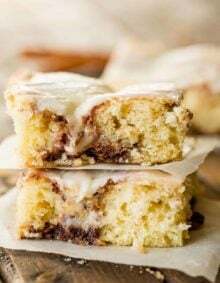 Place on wax paper and refrigerate until ready to bake. 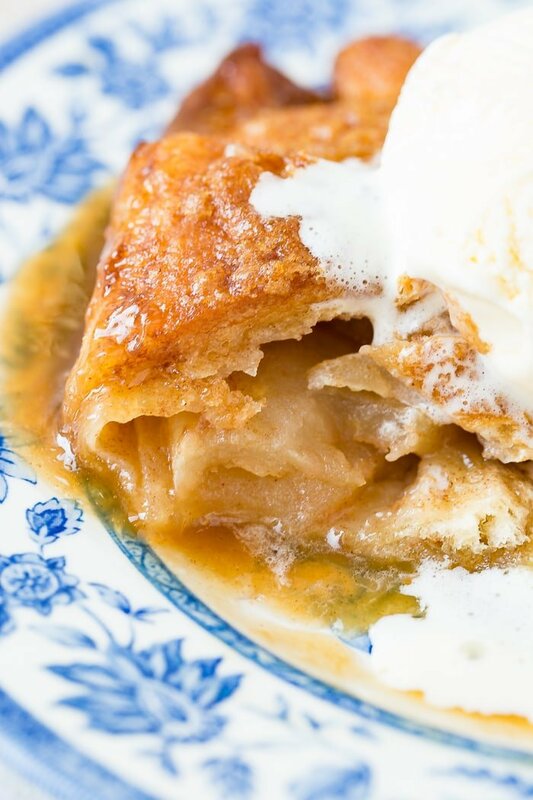 Can You Freeze Baked Apple Dumplings? Place the assembled apple dumplings on a sheet pan and freeze for one hour. After an hour, place the dumplings in a seal-able freezer bag and freeze for up to six months. To reheat apple dumplings, stick them in a pan with tinfoil over the top and place in a preheated 350 degree oven for 10 minutes. Or you can use the microwave for about 15 seconds. Looking for more delicious Fall Apple recipes? Make sure you try our Apple Cheesecake Bars, Apple Crisp, Apple Pie, Apple Cake with Caramel Sauce, and Instant Pot Apple Sauce. Who knew that crescent rolls, cinnamon sugar apples, brown sugar butter and sprite could make the best easy apple dumplings with sprite ever! Take one stick of the butter, and grease a 13 x 9 inch baking dish. Place remaining butter and the other stick of butter in a microwave safe bowl. Peel and core apples, than cut each apple into 16 thin slices. Toss the apples in a large bowl with the cinnamon sugar and flour. Pat out each crescent triangle a little bigger. Stir in brown sugar, vanilla and cinnamon. Pour over the tops of all the dumplings. Bake for 30-35 minutes, or until they become golden brown. Serve warm with a scoop of ice cream or alone. Perhaps I’m missing something. 2 cans of crescent rolls will be 16 rolls. 2 apples, each sliced into 16 slices, will yield 32 apple slices. The directions say to place 1 apple slice on each roll. That leaves 16 apple slices, or 1 apple, and no rolls. 1 thin slice of apple per crescent roll doesn’t seem very proportionate. Can you clarify the temp for me? The recipe says 350, but in the tips section above it, you say 400. Which is correct? These sound and look so good. However do we bake them at 400 or 350? Your blog description says a hot 400 degree oven but the recipe says 350, so which do I use to make them? I love most of your recipes. I tried your Carolina Pulled Pork and we loved it. It makes a lot so I have the uneaten portions in the freezer for quick dinners. Yum!